Yesterday the Premier & Minister of National Security Michael Dunkley joined the Minister of Home Affairs Michael Fahy and Senator Jeff Baron on a tour of the new hotel development, ‘The Loren’, on the former Pink Beach Club site to assess progress being made at the site, which is being developed by Sardis Developments Ltd. 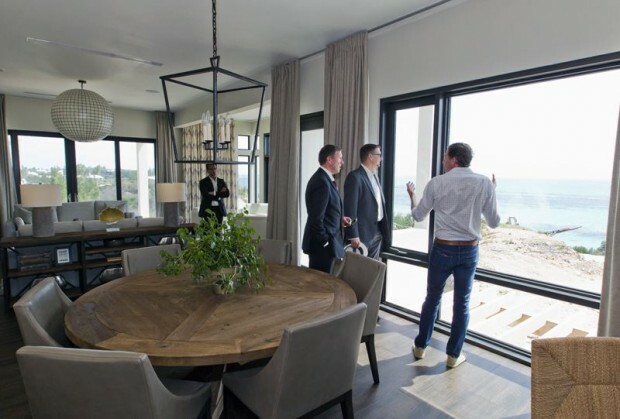 The Premier and Minister were accompanied by developer and owner Stephen King. 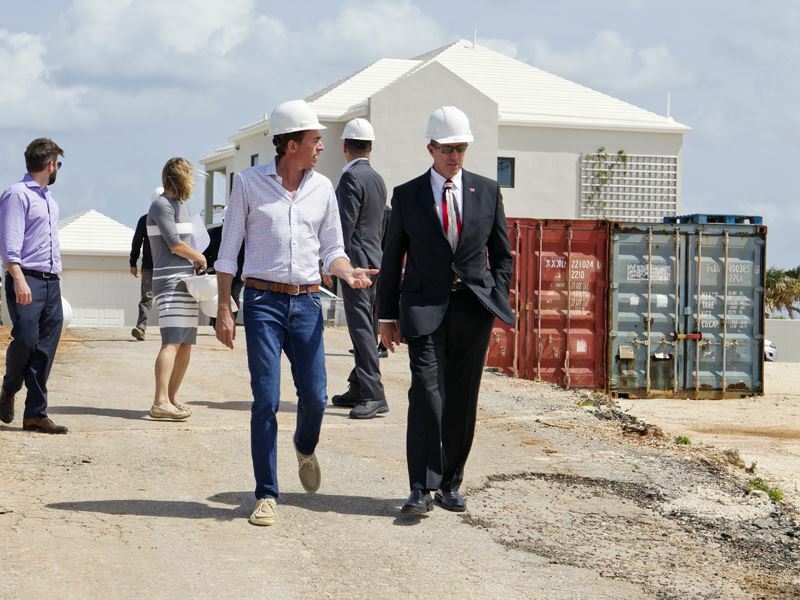 “I was extremely encouraged this week to see the progress being made at the former Pink Beach site,” said Premier Dunkley today. “We are delighted at Mr. King’s unwavering commitment to Bermuda. 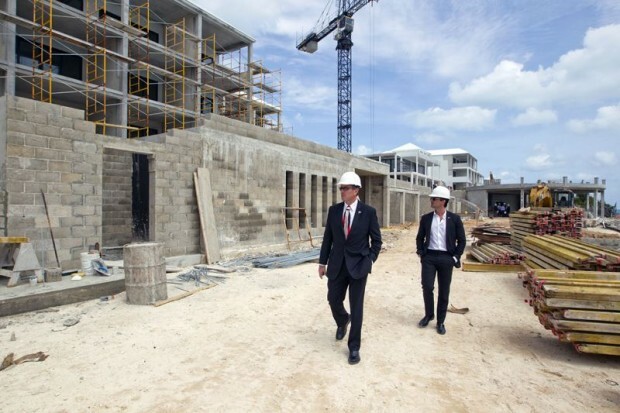 Meanwhile, Minister Fahy, who has responsibility for the Department of Planning and serves as a member of the Economic Development Committee [EDC] said, “The redevelopment of the site is an exciting event for Bermuda which has generated employment opportunities for Bermudians and will continue to do so once the hotel is up and running. “As the Premier has stated, it is extremely exciting to see the progress being made at the site. Construction on the main hotel buildings of The Loren is now complete and the doors and windows have been installed. 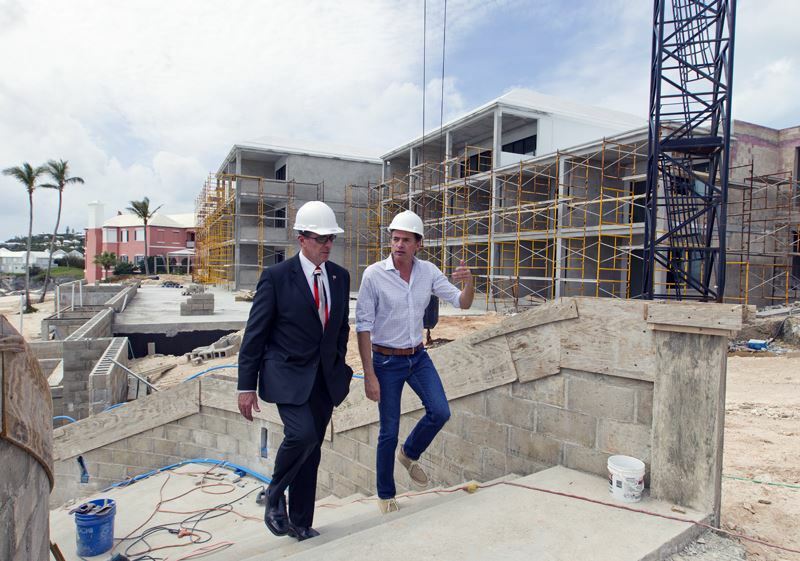 “We could also see that significant progress has been made on the beach club with work on the cabanas and pool well underway. 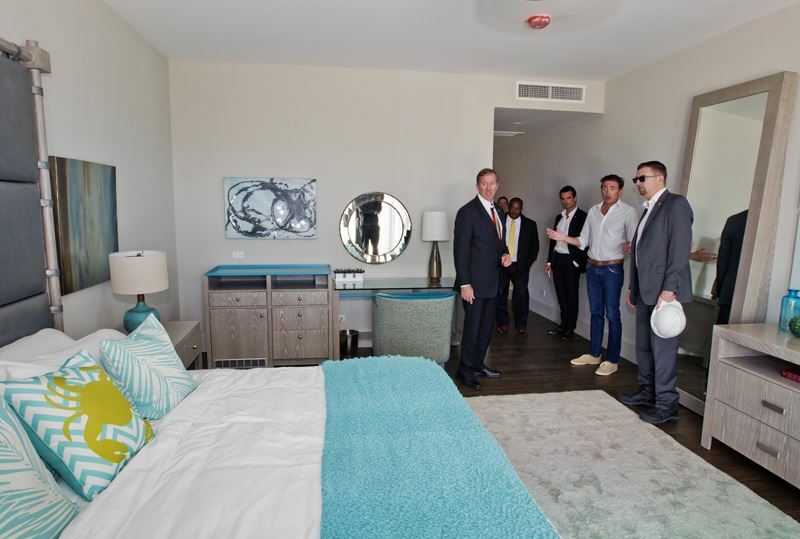 Additionally, the first condo is now fully finished and furnished, displaying the contemporary, clean design concept that will be continued throughout the hotel. “We will continue to work with those entities who are committed to, and supportive of Bermuda and I wish to thank Sardis Development Ltd. and Mr. King in particular for their continued dedication to this project. Mr. King commented, “We are encouraged by our progress at the site and are on track for a January 2017 opening. We hope to be operating at full capacity by the start of the America’s Cup. We would like to thank the Bermuda Government for their continued support and guidance. “It’s hard to imagine that only two years ago we had just bought this property; and when you look at what has occurred here in that time on the site it really is a tremendous achievement. “What gives us confidence is that we are at the stage where we are ready for the finishing touches to go in – the tiling will start soon and interior painting has already begun and the furniture has been ordered. Love it when I see people not wearing the ‘white hat of the day’. Gives a new me4aning to hard headed. I Will make it a point to stay here when i come to visit what once was my Island home, maybe I will be treated and respected better as a visitor, but to the Pink Beach , the project looks great and wish you all the success, think it might have been better just to give the progress report and photo’s without mister photo up having to be in the report. Leave your attitude behind and we might let you stay for a little while…..
One word, “impressive” Thanks former Minister Shawn Crockwell / O.B.A. for utilizing the former Pink Beach. This is a wonderful piece of ‘Bermuda’s Tourism Property’…….as of late………that our ‘Good Government’ has managed to revitalize to a newer Standard….better than the Old, antiquated Tourist developments of old that our previous administration did not…nor wish want to advance. Having worked on this property for months on end….I am, in my capacity of a Bermudian Registered Land Surveyor am proud, and happy to see. This has come to fruition Bermuda. Well Done !!!! Hopefully,something that started out so wrong, will end right….. one can dream and hope……cant they? No Rhonda …….As this project started under the previous administration and will be completed by our ‘Sitting Govt.’…It is a wonderful piece of ‘Our Rock’ and will be a valuable resource for years to come. I know every square inch of this property from the Sub-division proposal…to the ‘Grey Area’ in the arable land. Having Surveyed ‘ALL’ apects of it’s future development back in the day ……….of which has been sorted…..I just hear the ‘Make Noise EASY!!!’……perspective…..;)….. *laughing*……..